Friends may greet the family an hour prior to the service at the church on Saturday. Arrangements are with Hugeback Johnson Funeral Home in New Hampton. Calvin Charles Harris was born August 31, 1924, in rural Ionia, IA, the son of Francis “Mel” and Blanche (Feuchtwanger) Harris. He received his education in country school and was a 1942 graduate of the Nashua High School. 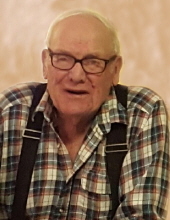 Calvin served in the United States Army during WWII in the South Pacific. He earned an Asiatic Pacific Campaign Medal and was honorably discharged on December 6, 1946. On February 12, 1949, at the Little Brown Church in Nashua, IA, he married Kathryn Kent. To this union, two children were born. The couple initially farmed near the Republic Church, rural Ionia, IA, from 1949 until 1962. They then moved west of New Hampton to the current farm site. Calvin had worked for the former Roach Mill in Nashua and also for many years at the Ionia Farmers COOP. Calvin always loved the farm life and became proficient as a mechanic, repairing all the farm equipment. During drives in the country, he was so observant of his surroundings and spotting wildlife. After retiring from the farm, he continued farming his huge garden sharing the produce with everyone. In his earlier years, he loved going to area lakes and rivers to go fishing with his neighbors and buddies. As he slowed down, he loved watching the Vikings, Twins, and Hawkeyes. He also loved to feed the birds and would grow cannas to attract the hummingbirds. To send flowers or a remembrance gift to the family of Calvin C. Harris, please visit our Tribute Store. "Email Address" would like to share the life celebration of Calvin C. Harris. Click on the "link" to go to share a favorite memory or leave a condolence message for the family.